Curriculum-based outdoor field trips for elementary school students are offered from mid-September through the end of October, and mid-March through the first week in May. Due to the size of the gardens, we request that no more than two classes (or 50 children) attend on the same date. Please provide one adult chaperone for each 10 students. A fee of $5 per student is requested to cover materials. A picnic area is available for outdoor lunch after your field trip. -Observe, compare, and describe the properties of trees, and parts of trees. -Compare changes in parts of trees through the seasons. -Acquire the vocabulary associated with the properties and structures of trees. -Use oral language to describe observations. -Observe animals that depend of trees for food and shelter. -Discover ways animals use and depend on plants as well as ways woodland plants depend on animals. -Observe ways that plants and animals in a forest community are interdependent. -Demonstrate an understanding of the concept that plants grow best in good soil and that good soil is made by combining sand, clay and humus. -Differentiate among the properties of soil (color, texture, water absorption, temperature). -Identify soil types/components (sand, clay, humus). -Recognize the role of soil in supporting plant growth. -Use appropriate tools to gather, analyze, and interpret data. -Relate structure to function in plants (roots for support in soil). -Demonstrate an understanding of the process of composting. -Demonstrate the ability to perform safe and appropriate manipulation of living organisms. -Identify characteristics and behaviors of worms that help them survive. -Describe how worm offspring are similar to parents (size, shape, color). -Describe interdependence of plants and worms (recycle plants into nutrient-rich humus, tunnels create spaces in soil for air and water). -Identify the basic parts of a plant and the function of each part: roots, stems, leaves, flowers. -Identify the basic parts of a flower and the function of each part: petal, stamen, and pistil. -Propagate plants using three different methods of propagation: seeds, cuttings, and division, and take their plants back to class. 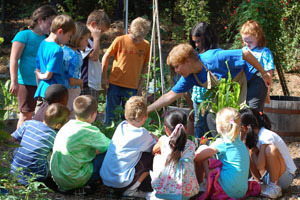 Field trips are scheduled weekdays from 9:30 - 11:30 a.m.
and mid-March through mid- May. To schedule a field trip, please email Debbie McDonald, Education Director, Aldridge Gardens at dmcdonald@aldridgegardens.com, or call her at 205-682-8019 Ext. 104. You will be contacted within one week about your field trip request. Picnic Area is first come, first serve. Please inform Debbie if you plan to use the picnic area.